On this rainy summer morning I nursed my second cup of coffee while getting lost in the stacks of books in my library. Sitting crossed legged on the floor surrounded by books on opera I was struck by how many times Alexander Pushkin’s name appeared along-side the works of the great Russian composers. This man who lived during the time of Byron and Goethe revolutionized Russian literature with his poems, plays, novels and short stories and inspired composers like Tchaikovsky, Stravinsky, Shostakovich, Moussorgsky, Rachmaninov and Prokofiev. Pushkin was born on June 6, 1799 in Moscow. His family was cultured and aristocratic. His father came from old boyar stock. His mother’s grandfather, Abram Hannibal, was an African slave from Cameroon who was bought as a slave at Constantinople and some sources say, he was adopted by Peter the Great. Hannibal became a general in the Russian Army and was eventually granted nobility status. Like many aristocratic Russian families, young Alexander and his brother and sister were raised in a home that mirrored many gentrified homes in Paris. French tutors and governesses insured that the children spoke and wrote in French. During the summer months he spent time at his maternal grandmother’s estate and it was there that Alexander heard glorious stories of his Russian ancestors. His beloved old nurse (a freed serf) Arina Rodionovna Takovleva told stories of Russian folktales that fueled his imagination and his creative spirit. She felt that it was her duty to instill in him a love of Russia to ‘make up for the defects in his accursed education’. In 1822 when Alexander Pushkin was 12, he enrolled in an elite school called the Imperial Lyceum. It was there that Pushkin channeled his creative energy. He wrote his first major work, ‘Ruslan and Lyudmila‘, a long romantic poem based on folktales that he no doubt heard from his old nurse. Ruslan, the traditional epic hero, goes through many adventures rescuing his bride Lyudmila who was kidnapped by an evil magician on their wedding night. This poem brought Pushkin his first taste of fame. In 1817 Pushkin accepted a position in the foreign office in St. Petersburg. He also became a member of the an underground revolutionary group, ‘The Union of Welfare’ – not a wise move if he planned to keep his government job. His ‘Ode to Liberty’ came to the attention of the authorities in 1820 and he was exiled to a remote southern province. In 1823 Pushkin began writing his tour-de-force – the novel in verse ‘Eugene Onegin’ which was published in 1833. Set in 1820s Russia, it is a snapshot of contemporary Russian life. Onegin the skeptic, befriends Lensky, the romantic freedom loving poet. Lensky loves Olga. Olga’s sister Tatiana the heroine, represents the ‘precious ideal’ of Russian womanhood. She falls in love with Onegin. He doesn’t return her affection. At a party Eugene flirts with Olga and Lensky challenges him to a duel and dies in the process. 3 years pass and Eugene who had spurned Tatiana, decides he wants her after all. But alas, she is married to a prince and even though she loves Eugene it is her turn to reject him. You’ll recognized the famous tune at 1:46! While Pushkin was writing Onegin, he was also writing Boris Godounov, a Russian historical tragedy in the Shakespearan tradition. Based on the career of Boris Fyodorovich Godounov the Tsar of Russia from 1598-1695, he is haunted by his guilt over the murder of Tsarevitch Dmitry. When an ambitious young monk claims to be Dmitry, Boris tries to defend his throne. He falls ill and dies. Boris Godounov was written in 1824-1825 while Pushkin was still in exile over his liberal views. It was written for ‘the people’ just before the Decembrist uprising of 1825. It addresses the tensions between the ruling classes headed by the Tsar and the masses and the ‘judgement of the people’. In 1826 Tsar Nicholas I, recognizing Pushkin’s enormous popularity, and knowing that he did not take part in the ‘conspiracy’, pardons him and allows him to return to Moscow. 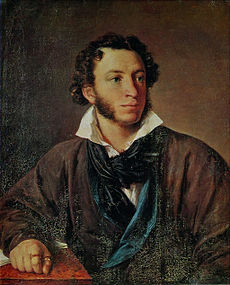 During the writing of Eugene Onegin and Boris Godounov, Pushkin also completed his long narrative poem, ‘The Gypsies’. It’s about a sophisticated city dweller Aleko who marries a gypsy girl and joins her people. When she grows bored with him and plans to run away with her new lover, Aleko kills her and is shunned be the others. 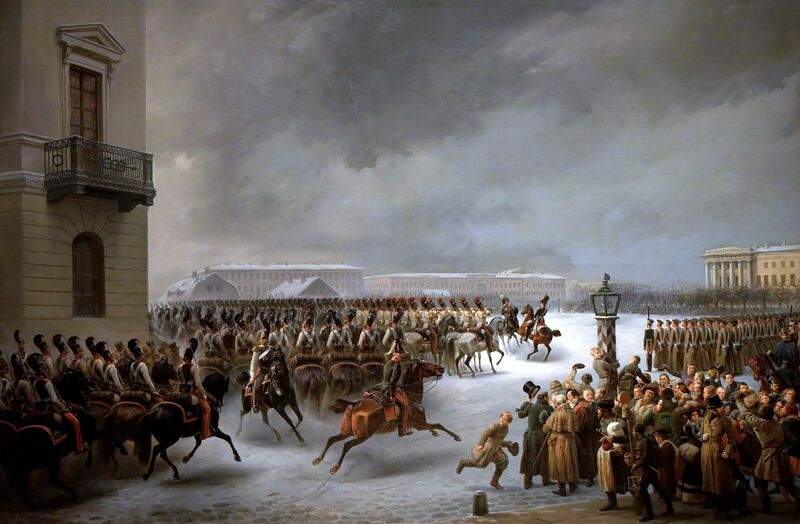 When Tsar Nicholas I allowed Puskin to return to the capital, he had a change of heart and Pushkin abandoned his open revolutionary sentiments. The Tsar promised that he would act as Pushkin’s censor and would carry out new reforms that would liberate the poor serfs. Censorship is not a good thing at the best of times – and the Tsar’s red ink proved more drastic than the official censors. Pushkin had even less freedom than before. 1829 marked the beginning of another period of productivity. Pushkin visited Transcaudasia for four months witnessing the drama between the Russian army and the Turks. In 1830 while visiting another family estate, Boldino, he was felled by cholera. Even while sick, Pushkin wrote a group of plays – among them ‘The Avaricious Knight‘, ‘Mozart and Salieri‘, ‘The Stone Guest’ and ‘The Feast During the Plague‘. 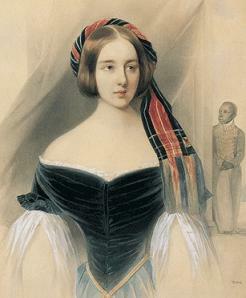 He married a young court beauty Natalya Nikolayevna in 1831 and settled in St. Petersburg. Pushkin’s debts were mounting and he was troubled by his wife’s possibly infidelity. The marriage was unhappy and Pushkin had little peace of mind for intense creative activity. Rumours started to fly about an affair between a young French émigré and Natalya. Like a scene from his plays, Pushkin defended his wife’s honour in a duel. And like the ending of his plays, he was fatally wounded and died on February 10th 1837. Because of fears of popular uprisings at the funeral, the Tsar buried Pushkin in secret in the monastery near Mikhailovskoye. He also absorbed his debts. never to end this pain.